When you are organizing a meeting, it is important to let the attendees know just what is going to be happening and when. With the help of this meeting agenda template, you can do just that in a quick and easy manner with professional results. 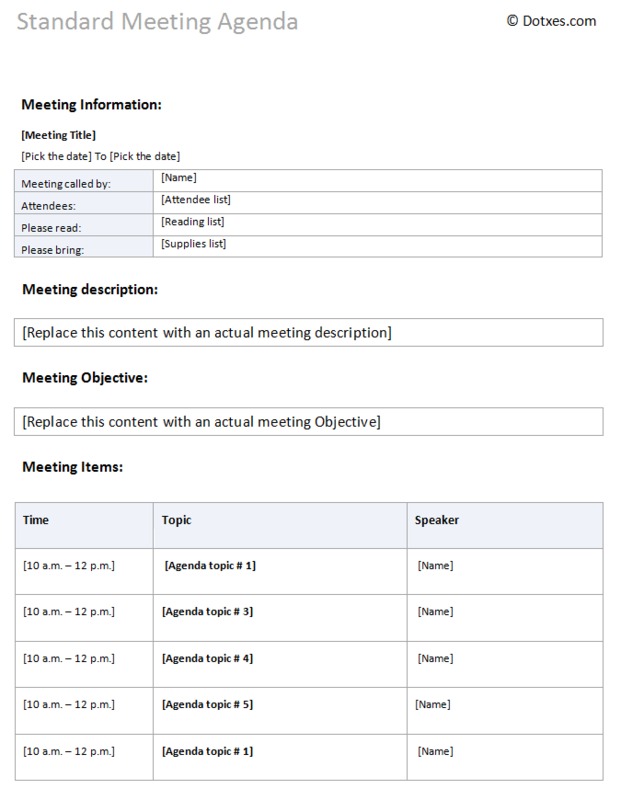 This template allows you to create an agenda for any type of meeting, and to fill in the personalized details in regard to that meeting. Fill in as much information about the meeting as possible in the fields provided in the template. Include a time period for each discussion that is going to take place so that everyone stays on track throughout the meeting. List every topic that is going to be discussed, to keep things organized and on track. Create enough copies of the meeting agenda so that every attendee has one, plus a few extra in case someone loses theirs. Simple. Detailed. For the meeting date, instead of having Date to Date, I would put Date and then underneath or beside that, Time to Time.